Song consists of long, melodious, warbling phrases that sound similar to “In the Mood”. Description: Sexes similar. Gray or olive-gray above; white underparts; dusky eyeline; white eye-stripe without dark upper border; brown eye; and no wing bars. Crown does not contrast sharply with back. 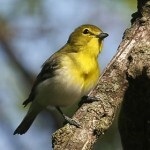 Habitat: Found in open stands of deciduous forest, including streamside vegetation, scrubby hillsides, and suburban areas. Preferred nesting sites include tall cottonwoods near streams. 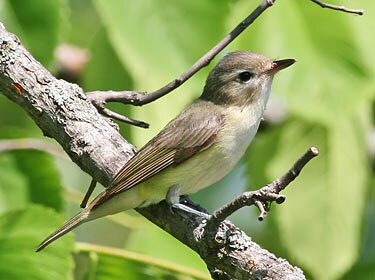 Where in Nebraska: Common spring and fall migrant, and summer resident across the state. Regular breeder. 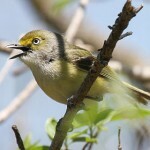 Fun Facts: The Warbling Vireo’s have the largest range of any member of their family being found from western and southern Canada and all throughout the United States. 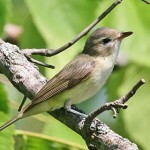 Additional Information: The unrelated Garden Warbler (Sylvia borin) of Europe is found in the same habitat as the Warbling Vireo, and has evolved an almost identical song.